Well, it was all set up for the grand curtain raiser at Municipal Stadium. A new season, a dazzling new kit, new players - the mighty Farangutan Football Club (FFC) versus, er, ahem, a concrete company, CCP Concrete. The Real Madrid style strip did not immediately deliver the champagne football the UN Irish Pub had been hoping for. 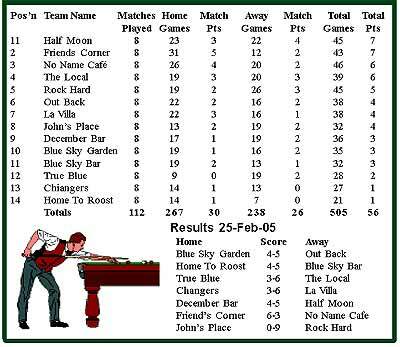 Indeed, its patchwork team of playboys and Casanovas took its time to shake off the cobwebs after a punishing 6 month pre-season regime of unprecedented bingeing and debauchery. Not until Shawn had dropped into a deeper midfield berth after 15 minutes did FFC begin to take the measure of their opponents. Dropping deeper to plug the gap in the centre of the park, Shawn was able to both protect his back four and prompt his team mates into attacking positions. Thus it was that after some early scares, the FFC outfit began to find their feet. With a front line led by the Hinsh, free of the burden of management, ably supported by the offensively-minded midfield duo of James and Rick, chances began to fall to the Farangutans, and with a better pair of shooting boots, there would have been a goal or two. The opposing goalkeeper also had a hand in proceedings, ably saving an attempted lob from Adam, who was put through on goal by Rossco on one of his surging forays up field. As it was, the boys in white were unable to capitalise on their enterprising play, and the teams went in level at half-time. Half-time oranges accompanied wholesale changes to the FFC line-up. Leandro, Dave, Troy (congratulations on your debut!) and Masao all entered the fray for the second half, and it took some time for the team to regain its balance. Capitalising, the concrete crew renewed their assault, only to flounder on the granite rock of the Irish Pub defence and faultless goalkeeping. Two of the back four won Man of the Match points such was their resilience - well done Dr. Tim and Big Lee. Big Warren might also have won something for his ball-winning challenge on 65 minutes. Unfortunately, there had been a Thai opponent between him and the ball prior to the tackle, and the poor chap found himself surplus to requirements. After the player had been retrieved from the nearby car park, a shiny yellow card was the defender’s only reward. 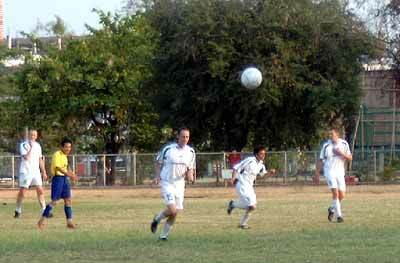 After weathering the storm, FFC began to probe again, prompted by the tireless running of Man of the Match Rick Mann. In an open last quarter, either side could have stolen the points. 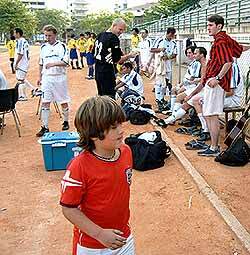 Chris replaced Adam to lead the Farang charge in attack, but it was the Concrete boys who broke the deadlock on 86 minutes. An excellent turn and rifled shot from fully 20 yards left Markie Flowers with no chance - a goal worthy of winning any game. Final score 1-0, but the FFC were by no means disgraced, and on another day the scoreline might have been reversed. Mick Davis was on the touchline to console the players at the final whistle. With the talismanic Davis and co-striker Chico unavailable due to their decisions to bugger off somewhere else, FFC have to look to next weekend in their quest to find the back of the net, or at least the back of Loi Kroh Road. A final word for Mick: good luck with your new life dude, and thanks for all the great goals! We’ll miss you. As all of you who spend your time fundraising know, it is very difficult to find new ways of getting donations. Let me introduce you to my two new best friends! Each time I have driven to Ban Tawai I have noticed a shop with strange little people sitting on the forecourt. They all have gold faces but they are artists, doctors and teachers, and most famously Einstein. 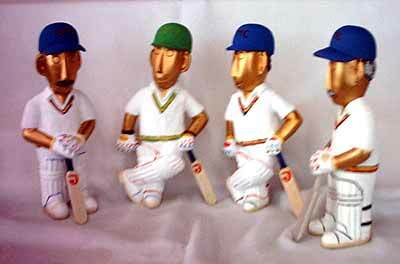 The eggheads, little people with gold faces, now available as ‘cricketers’. Many of the ladies in Chiang Mai will know my next ‘savior’, Linda Khampan. I was introduced to Linda when I was explaining to a friend that I was fed up being told “We have no clothes for fat lady”. Linda, in my opinion, is the best dressmaker in Chiang Mai, and her husband a superb tailor. I was bemoaning the fact that, I needed something different for selling at the Chiang Mai Sixes. I explained that I would like place-settings and drink coasters. Linda just said ‘leave it with me’. The result – the most beautiful linen place mats with just one cricketer in the corner, and shoulder ‘sack’ bags in linen, with the word Cricket (the I being a bat) embroidered on the pocket. Linda works from 5/6 Nantana Vill Mahidol Road, Chiang Mai, and her telephone number is 053 270808. Come and see the results of their hard labor at the Chiang Mai Schools Cricket Alliance Stand at the Chiang Mai Sixes, Gymkhana Golf Club, from Sunday March 27 until Saturday April 2, from 8.30 a.m. until 5.30 p.m. daily. Mini-golf enthusiasts have a new venue option in Chiang Mai after the grand opening of Go Putt-Putt Crazy Golf which was presided over by Junnapong Saranak, the director of the Tourism Authority of Thailand (TAT), Northern Office, Region 1 and Pornchai Jitnavasathien, the vice mayor of Chiang Mai. 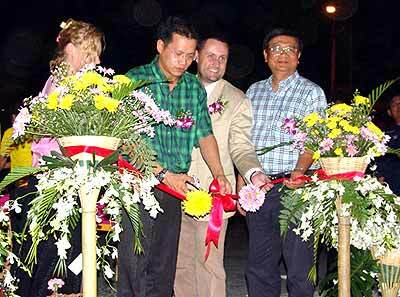 (From left to right) MD Carmen Rademaker, Pornchai Jitnavasathien, vice mayor of Chiang Mai; David O’Hanlon, director of Go Putt-Putt Crazy Golf and Junnapong Saranak, TAT. Go Putt-Putt Crazy Golf was designed by a Dutch team, with decorations and obstacles made by two artists from New York City, Chadwick Gray and Laura Spector, who have been involved in similar projects for the past 10 years in the U.S.A. and Europe. Go Putt-Putt is modern, colourful, educational and fresh. Carmen Rademaker, the managing director of Crazy Golf, the group behind Go Putt-Putt, was very enthusiastic at the opening, “Crazy golf is a fun way to compete with each other and can be played by all ages and skill levels.” She and her business partner David O’Hanlon plan to expand Go Putt-Putt Crazy Golf throughout Thailand to make it a leading and recognised mini-golf branding nation-wide. The ‘Around the World theme’ includes internationally recognisable obstacles from around the globe with special effects which give an extra dimension to the fun part of the game. The complex is covered and there is also a full service restaurant serving drinks and food with an “around the world” menu in the centre of the golf course. Go Putt-Putt Crazy Golf is in the Chiang Mai Business Park (behind Carrefour), beside the Wachirawit School and in front of Payap University. It is open daily from 11 a.m. – 11 p.m. except Mondays.